The New York Times is still talking about polar bears — as communities around the world are fighting for survival. Newsflash: Corporate media isn’t covering the movements that matter. Case in point: Only months after reporting that 2012 was the hottest year on record, The New York Times eliminated its environment desk. 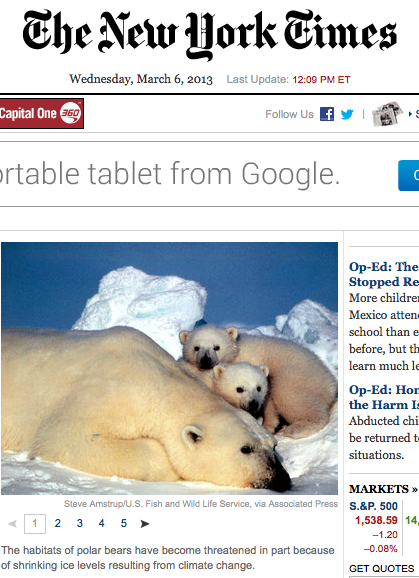 The Times is still talking about polar bears — as communities around the world are fighting for survival. But at Waging Nonviolence, we’re increasing our environmental justice reporting. We’ve been closely following the indigenous-led Idle No More movement, which began in Canada and has helped escalate the fight against fossil fuels in Utah and across the United States. We’ve reported from the Tar Sands Blockade in rural Texas and debated the effectiveness of the largest climate rally yet in Washington, D.C. We’ve been on the front lines of the efforts, from post-Sandy New York to Detroit, to build an environmental movement that puts marginalized communities first. We’ve followed the fight against fracking from Albany to South Africa. Now we’re planning to create a dedicated environmental justice bureau to do even more. We want to thank everyone who has already joined our new membership program in the past month. Your support will make it possible for us to continue publishing stories that corporate media simply doesn’t care about. We can no longer rely solely on foundation grants to fund movement reporting. We need our support to be as grassroots and bottom-up as the movements that we cover. If you haven’t haven’t yet become a member, please become a member today. If you regularly read Waging Nonviolence, or if you believe that having a non-corporate, movement-focused news outlet is essential to building a better world, please join today — for as little as $2 a month. See you on the web and in the streets. Please: We really do need you. I know we’ve all gotten used to getting content for free, but we pay our contributors for the work they do, and we can’t do that without our readers’ help! I second that! And a huge thank you to all the artists, activists and social justice lovers that have already become members! !